NB: If an individual’s Christian or surname is currently unknown this is indicated by an asterisk placed between brackets [*]. Little is presently known about Nemesis other than the few details recorded by Saul Kibberman in his review of the band’s support performance to Split Enz at UNE in early March 1976. Kibberman records that despite having been together for only three weeks Nemesis “turned in a thoroughly professional set… [displaying] a consistency in both style and presentation, that augurs well for their future.” The review goes on to report, however, that while the lead vocalist had “one of the most dynamic and expressive voices [he had] heard” it was “for most part drowned out or muffled by a poor mix from the front of house engineer (p. 17). Source: Saul Kibberman. “Spellbound with Split Enz,” Neucleus 17 Mar. (1976), p. 17. Originally from Newcastle (NSW), Rod Noble was involved in the Armidale music scene in various capacities between 1971 and 1976. The son of a railway worker, and grandson of a coalminer and a merchant seaman, he not surprisingly became interested in the union movement from an early age. Having left Newcastle Technical High School at 15 or 16 years of age he undertook an apprenticeship as an electrician at the BHP steel works, and was later employed at the State Dockyard and on the Railways before travelling overseas. Following a stint in a Buddhist monastery in India, Noble moved to Armidale in 1971 to undertake a BA degree at the University of New England and soon became heavily involved in both broader student and campus politics through his involvement with the Socialist Action Movement (S.A.M. ), and as the University’s 1972 Australian Union of Students (AUS) Secretary. That same year he also took up the position on the Student Representative Council (SRC) as International Officer. During his second and third years he wrote a number of articles and letters to the student newspaper Neucleus mostly in relation to S.A.M. issues. One of his final activities as an organiser was to help put on the People’s Incredible Folk Rock Concert at UNE in October 1973 (see Madgwick Hall entry for further details). The following month his contribution to student affairs at UNE was acknowledged in a farewell article published in Neucleus (see attached file below). "Rod Noble bearing the flag forward"
One of Noble’s earliest musical associations was in 1972 when he and fellow student Alan Oshlack (aka Al Japaljarri) formed a duo to play as one of the supports to American folk legend Phil Ochs at UNE’s University Arts Theatre (July). The pair may have been billed as Motley for the performance. In correspondence (Apr. 2010) Noble recalls that Ochs was very drunk prior to his performance but pulled off a great performance. Later that same year Noble and several friends put together a ‘scratch’ band which played a benefit concert at the UNE Union complex. The event was organised by the S.A.M. as a means of raising funds to provide legal aid for several students who had been arrested for possession of marijuana. According to Noble, the lead singer and two backing singers had consumed a number of hash cookies earlier and pulled out of the gig just as the band was called to perform. The remaining musicians were left to sing an exceedingly long version of Cat Steven’s’ “The Longer Boats” before discontinuing their set. He recalls, however, that while the other acts may have been more professional the ‘scratch’ band probably had the most fun. At that time Noble shared a house (Big Pink – Outer Rockvale Station) with Neucleus editor, Bob Cavanagh (1972) and poet Arthur Chaffey. In 1973 Noble continued to live in the Rockvale area, this time in a commune at the Old Rockvale Pub, where many ‘musical happenings’ eventuated – some planned, some impromptu. In early 1974 he left Armidale with fellow S.A.M. leader Adrian Shackley and spent a significant part of that year in South America where they became immersed in numerous political activities. The pair was inspired by the visit to Armidale of Joan Jara, wife of Chilean musician Victor Jara who was murdered during the 1973 coup against the Allende government. Shackley’s and Noble’s contributions to student life in Armidale, were acknowledged in one of the final Neucleus issues of 1973. Noble returned to UNE in 1975 to continue his studies and wrote several more articles in the student newspaper, including a contribution to the special four page feature on socialism published in the October 1975 issue. He also continued to be involved with traditional music performance, and in 1975 he, David Curtis and Andy Berriman put together the Armidale People’s Bush Band – a precursor to the popular Armidale Bush Band. Although the People’s Bush Band only ever played in the Armidale Mall and at a couple of student demonstrations and charity events, it nevertheless played a role in advancing folk and bush music to both students and the general public of Armidale. In late 1975 Noble formed a bush band with Peter Faircloth, Phil Craven, Ian Reeve, Carol Clifford and Phil Ryan. It became known as the Armidale Bush Band. By the end of the 1976 the group was to become one of the most popular folk/bush entertainments in the Armidale/Uralla region. After securing a regular gig at Thunderbolt’s Inn (Uralla) they quickly established a strong following with shearers from the Uralla district, and found an equally enthusiastic following in Armidale through their association with the Galloping Grape Bistro and the University of New England (notably at the Bistro). In this respect the band had a major influence on later groups like the Boorolong Bush Band, Patterson’s Curse and The Ragweed Reelers (aka Captain Pugwash). Noble also recalls his friendship and musical associations with Ewan McColl and Peggy Seeger around this period. McColl and Seeger were the organisers of a concert at the UNE Arts Theatre in 1976. 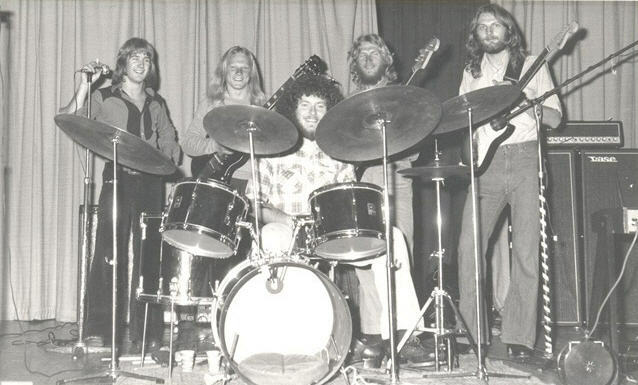 The Armidale Bush Band broke up in late 1976 when several members were required to leave the Northern Tablelands in order to pursue their careers. Those who stayed went on to reprise the band for a brief period. Noble began working for the Newcastle Trades Hall Council in December 1976, first as a research officer and then as an occupational health and safety officer until 1990. He then became an academic at the University of Newcastle, working there for 20 years teaching occupational health and safety, Labour history and industrial relations. Noble’s affiliation with various political organisations has included being a founding member of the Armidale-based Socialist Action Movement (SAM) from 1971 to 1976; a member of the ALP (1975-1976); the CPA (1976-1990); the Newcastle-based Socialist Interest Group (1992-1996; and a founding member of the Progressive Labour Party from 1996. He has represented a number of different unions including the Miscellaneous Workers Union, Teachers Federation and National Tertiary Education Union, and in 2007 was elected onto the executive of NTHC in August 2007 representing the NTEU. In addition to his teaching and political life Noble has conducted research for the book Lake Macquarie Past and Present, co-authored The Social Dimensions of OHS, and written numerous articles and papers in his areas of specilisation, and in December 2008 had his book on the history of the Hunter Valley Labour Movement Of Human Right and Human Gain, published. He is also an elected organiser of the Newcastle People’s Chorus—a Hunter Valley-based social justice and union choir. 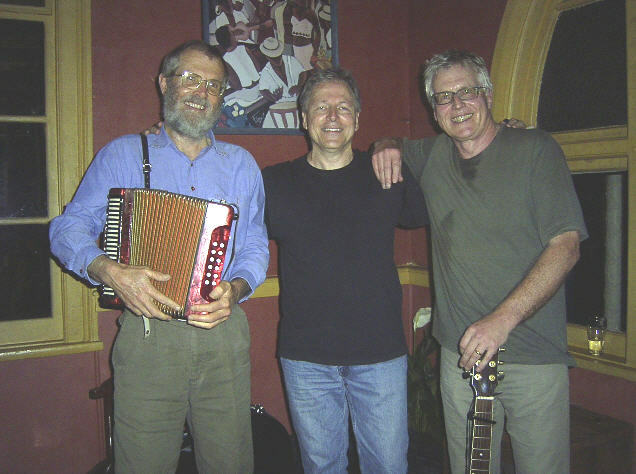 In later years Noble returned to the Armidale area, and in early 2009 coordinated an Armidale Bush Band revival with two other original members, Peter Faircloth and Ian Reeve. Rod Noble’s Neucleus articles and correspondence include: “Is Australia a Free Country? 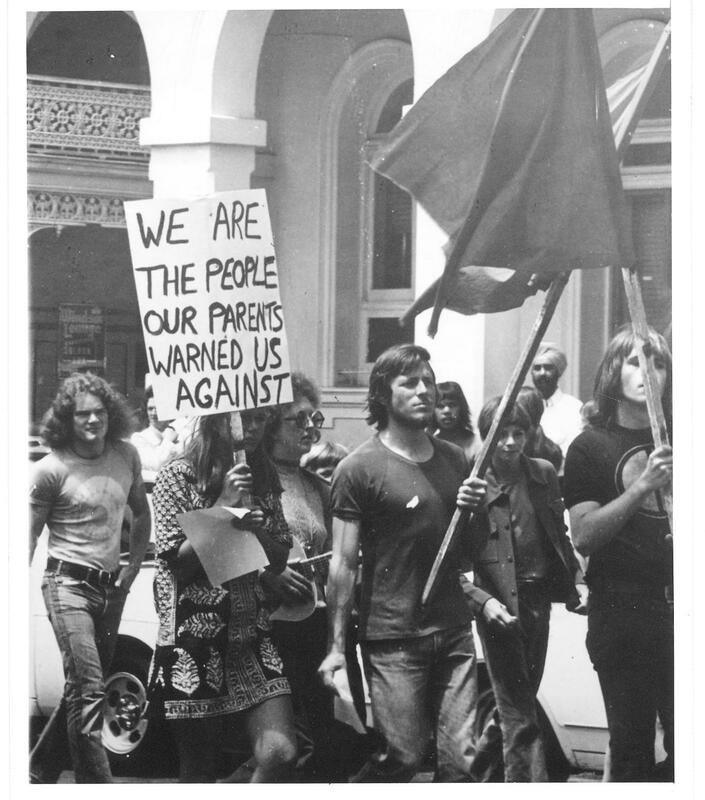 Are Australians Free People?” (April 1972, p. 8); “Socialist Action Movement (S.A.M. )” (28 June 1972, p. 5); “S.A.M. Socialist Action Movement” (6 March 1973, p. 6); and “S.A.M. for the Defence” (letter – 3 April 1973, p. 3). See also the special feature section on S.A.M. published in the October 1975 issue. Sources: Neucleus (1972-1976) • Rod Noble (correspondence and interview, Jan. 2010; correspondence, Apr. 2010). Images: Anti-war Rally photo (21 Oct. 1972) courtesy of Rod Noble (also published in Neucleus 29 Oct. 1974, p9). • All other photos courtesy of Rod Noble. Born in Armidale, Garry Osbornewas one of the town’s leading drummers during the 1970s. As with his brother, Neil (aka “Nobby”), “Gazza” Osborne completed high school (then 6th form) at De La Salle College in 1972. 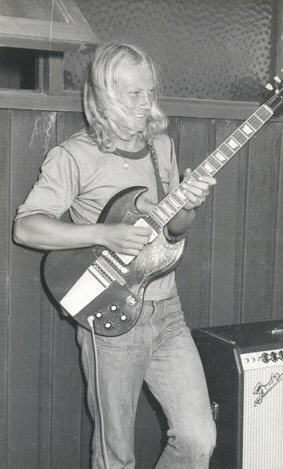 While still at school Garry became a founding member of Mantra, one of Armidale’s premier bands of the 1970s. 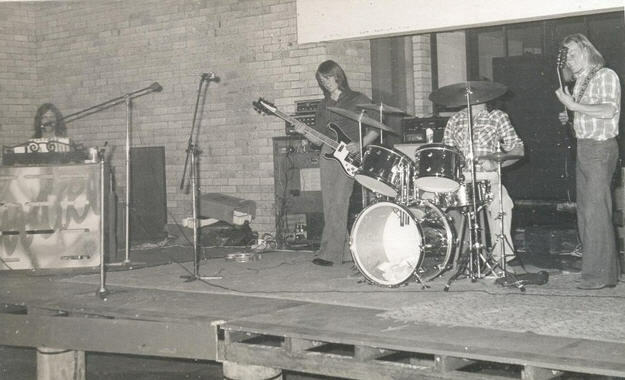 Formed in 1970, Mantra was essentially the merging of two other seminal Armidale bands of the 1960s bands – Artisans and Firebirds, with Rocky Lane, Ralph Monley and Greg Goldsmith having been members of these two groups. 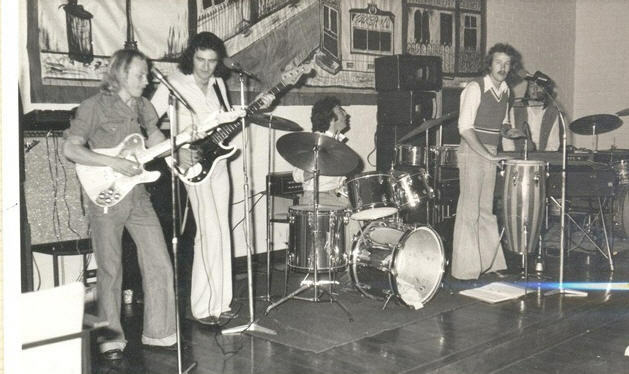 Mantra’s reputation was such that several other local bands (notably Bogislav and Trek) decided not to compete against them at the 1972 Hoadley Battle of the Sounds competition, preferring instead to play heats in other nearby towns. Osborne was joined briefly in 1974, shortly before the band broke up, by his brother. Sometime after Mantra broke-up Osborne was invited by Robbie Gray to join a new band he was putting together in the wake of the Robbie Gray Big Band. Needing a guitarist Gray was encouraged by his new drummer to travel to Northern New South Wales to check out Nobby, then playing with a band called Shearwater. The brothers subsequently joined forces again. They remained band mates in Ukiah, the group which morphed out of the Robbie Gray Band in 1976. As with his brother, Garry Osborne has carved out a career as a teacher, eventually returning to his alma mata O’Connor Catholic College (formerly De La Salle Catholic College). He continues to play music, with his latest band (ca. 2011) being The Axe Men. See also Neil Osborne entry (including a photo of the brothers and Kim Constable jamming with Cold Chisel’s Don Walker at the Galloping Grape Wine Bar in 1978). Garry Osborne’s 50th birthday jam: With brother Neil and members of the Maxwell Street Blues Band. Sources: Brian Moore (interview, Aug. 2010) • Neil Osborne (correspondence, Nov. 2010). Images: Courtesy of Neil Osborne. Born in Armidale, Neil “Nobby” Osborne and his brother Garry attended De La Salle College (now O’Connor Catholic College). While a 4th Former (now Year 10), in 1970 “Nobby” played lead guitar in Manic Depression, a band which also included his cousin Bob Lane. The following year three members of the band – Osborne, Lane and Wayne Yoemans – joined forces with Brad Dunham and Brian Moore (both from De La Salle’s other band Purple Haze ) to form Shane. Within a short period of time Shane established itself as one of Armidale’s premier bands of the early ’70s, playing numerous gigs in town and around the Northern Tablelands despite all the members still being school students. 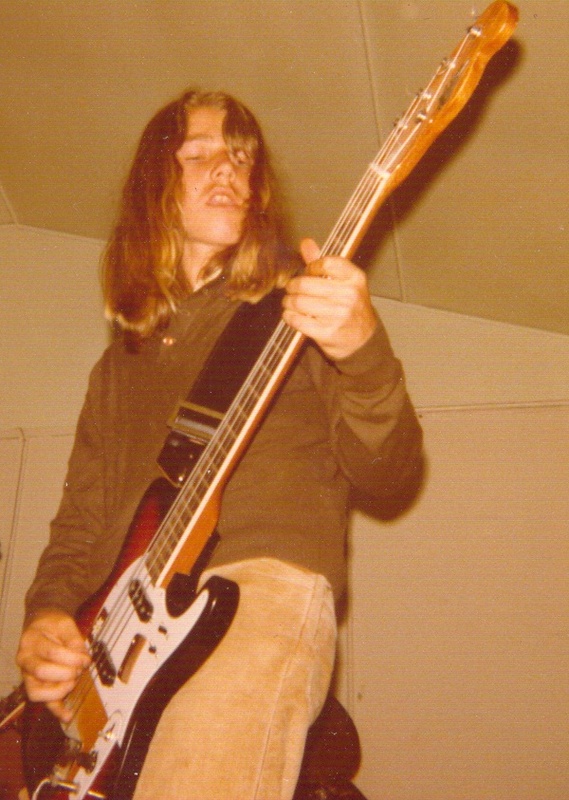 One of Shane’s biggest achievements was making it all the way to the 1972 Northern New South Wales Finals of the Hoadley Battle of the Sounds competition. After graduating from school in 1972 Osborne began a two year course at Armidale Teacher’s College, training as a science teacher while continuing to play music on a semi-professional basis. Two of the musical collaborations around this time were with Fireband and . Sundown formed in 1973 shortly after Shane broke up. The band (Osborne, Trevor Day , Paul Whiten and Neil Curry) spent three months based at Yamba over the summer/university holidays. Bass player Trevor Day’s in-laws apparently owned half the town being in real estate. According to Neil Osborne, all the members, except Day, stayed at the Blue Dolphin Caravan Park in a four-man tent. Sundown played at the top pub at Yamba, as well travelling up the Gwydir Highway to play several Glen Innes hotels (the Royal and the Boomerang). 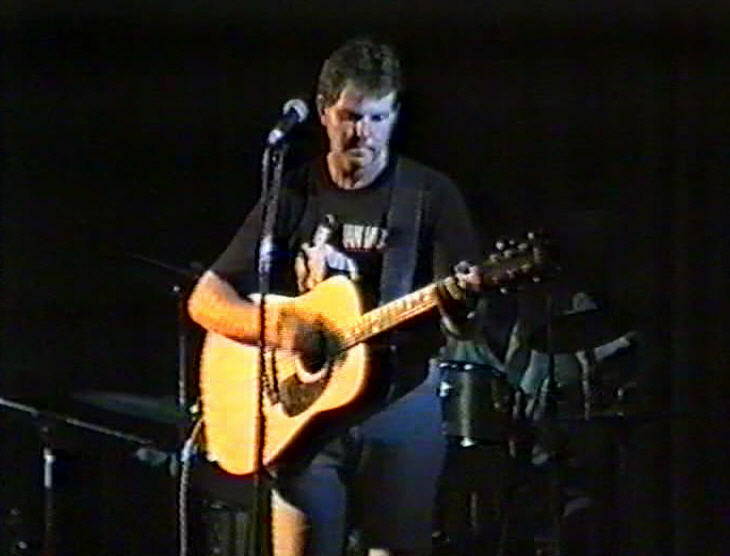 After returning to Armidale played a few university gigs before disbanding. Comprising Neil Osborne, Brad Dunham, John Nurse, Trevor Day and Bob Jones, Fireband formed in either late 1973 or early 1974. By this stage Osborne’s music commitments were interfering with his studies so he deferred for a period of time. When Fireband broke up later in the year he was invited to join his brother in Mantra, replacing Larry Townsend on lead guitar for the band’s final six months. Following the break-up of Mantra, Osborne moved to Duranbah (in the hinterland behind NSW North Coast own of Kingscliff) to join some friends in Shearwater. Named after a local water bird the band had been performing professionally as a trio until then. During his tenure with Shearwater Osborne played a regular Tuesday to Thursday gig at the Chances R Bar (nightclub) at Surfers’ Paradise as well as numerous other popular venues in the region. The band also played weekend gigs as far away as Armidale and Glen Innes. 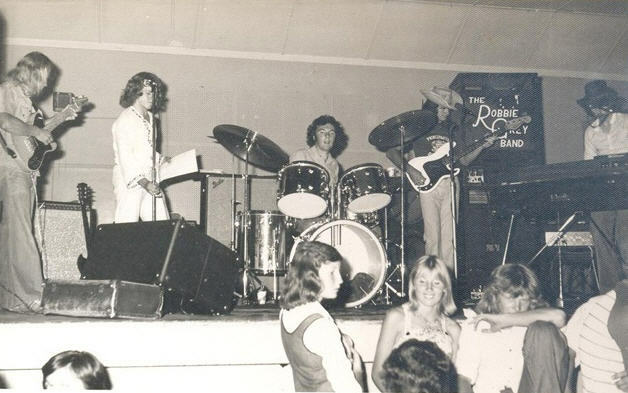 Towards the end of 1974 Osborne’s brother Garry and Robbie Gray travelled to the Gold Coast to check out Shearwater, and he was subsequently invited to come back to Armidale to join the Robbie Gray Band. When Gray left Armidale to return to Sydney the band continued with a new name, Ukiah, and soon established its reputation as one of the leading bands in the Northern Tablelands. In 1977, while with Ukiah, Osborne lived for a period of time in Inverell with another “Nobby” – Neil Aubrey (and his wife). He remained with Ukiah until 1978, at which time he was offered a teaching position at Ashcroft High School in Sydney’s south-west. 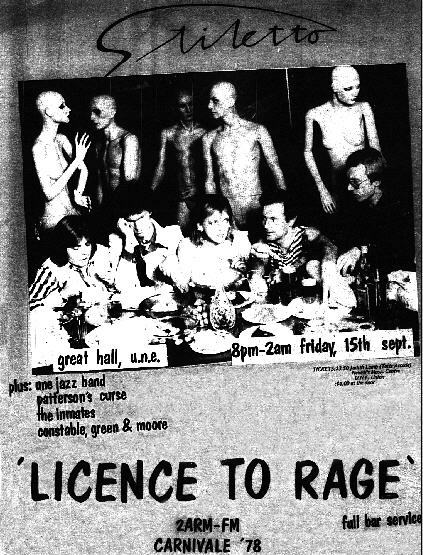 After arriving in Sydney in 1979 Osborne joined Point Blank, a band based in the Green Valley area near Liverpool, playing with them until 1983. “Every one of the band members,” he recalls, “was a second or third generation Australian.” Playing a mostly original repertoire, which Osborne says was a real blast because he’d always been in covers bands up to then, Point Blank found gigs in local Liverpool pubs before scoring a regular spot at a wine bar in Glebe Point Road, Glebe. They also played a support for The Angels at the Leppington Inn, although Osborne remembers that night more for the serious accident that occurred when he and another member of the band (who’d decided to take a short-cut) had crashed into each other. After waking up in Westmead Hospital two weeks later Osborne also discovered that his prize 1969 Gibson had been stolen from the wreckage by one of the tow truck drivers (he never got it back). After recovering from the accident he worked briefly at Parramatta Marist Brothers High before applying for a position in Lismore. Neil Osborne’s teaching career has seen him work in numerous schools throughout New South Wales for over four decades. After the breakdown of his first marriage he returned to Armidale to further his studies (completing a Grad Dip in Psychology at the University of New England). Tired of teaching science after 15 years he was encouraged to retrain as a TAS teacher (woodwork, metalwork and electronics) at Sydney University. Osborne was “rewarded” with an initial position at Condobolin in Central West region of NSW, before being relocated to Red Bend Catholic College at Forbes. With his second wife, also a teacher, he later moved to Mittagong (where he completed a 12 months course in Fine Woodwork) and finally to the Southern Highlands of NSW. As of 2011 he will be teaching at Moss Vale High School. See also Garry Osborne entry. Source: Neil Osborne (correspondence Nov. 2010). Images: Courtesy of Neil Osborne. A Uralla-based bush band, Patterson’s Curse (also often spelled Patterson’s Curse) was founded in 1978, and quickly became one of the more popular groups playing folk/traditional and bush music in the region during the late-’70s. Other bands playing these genres included Ragweed Reelers, Dusty Dogwood, the Horton River Band and Banish Misfortune. The origins of Paterson’s Curse can be seen to have been influenced to a degree by The Bushwackers (which the group supported in Armidale one year) and the Armidale Bush Band, of which Ian Reeve was a founding member. 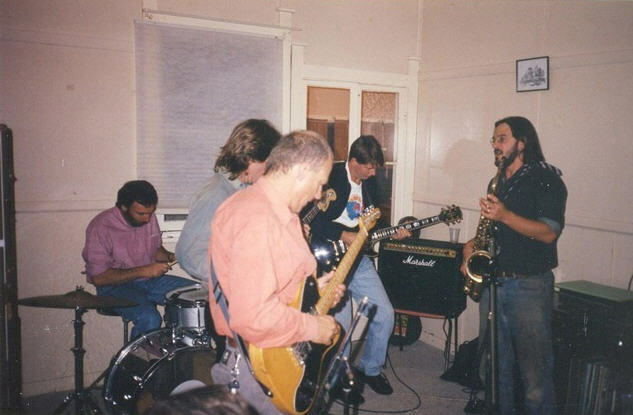 The influence of Rod Noble (Armidale Bush Band) and the high profile UNE-based Socialist Action Movement could be heard, too, in a selection of songs from the trade union tradition. Paterson’s Curse played regular gigs at the Coachwood and Cedar (Uralla) ca. 1978-1979 and also played the Galloping Grape on a number of occasions in 1979. One of its biggest gigs, however, was as the first support act to Stiletto at RockFest ’78 (held at the UNE Great Hall on 15 Sept.). Ian Reeve recalls in correspondence that Paterson’s Curse played several gigs which were headlined by local rock bands. Although largely playing acoustic instruments (with the aid of microphones), Reeve further notes that the band’s ‘full-on, strongly rhythmic music’ went down well with the same pub audiences. Sources: Ian Reeve (correspondence, Apr. 2010) • Neucleus (1978-1979). Image: Neucleus 13 Sept. (1978), p. 24. Personnel incl. Dean Bourke (bass/vocals) ; Gerard Bourke (guitar/vocals) ; Peter Cummins (guitar/vocals) ; Doug Jamieson (lead vocals/guitar) ; Brian ‘Lanky’ Moore (drums). Point Blank is believed to have formed sometime in the late 1980s around Dean Bourke, his brother Gerard (ex-The Zip) and Doug Jamieson (formerly of Trek and the Robbie Gray Big Band). The band’s repertoire, comprising mostly covers, ranged across contemporary songs from artists and bands such as Ian Moss (Cold Chisel), Paul Kelly, Johnny Diesel, Dragon, The Black Sorrows, Australian Crawl, Bryan Adams, Robert Palmer and the Travelling Wilburys to classic hits from the ’60s and ’70s by Daddy Cool, Cold Chisel, The Angels, Dire Straits, The Rolling Stones and The Beatles. While Jamison was the band’s frontman/lead singer, Cummins and Dean and Gerard Bourke also provided co-lead or the occasional lead voice (notably Dean Bourke with ‘Sultans of Swing’) in addition to supplying harmony vocals. Gerad Bourke and Peter Cummins also shared lead guitar duties. In the early 1990s the band’s original drummer was replaced by Brian Moore (ex-Constable, Green and Moore/Kelsey/Shane/The Chooks). The band broke up about a year later. Photos: clockwise from top left: Doug Jamieson; Peter Cummins and Gerard Bourke; Brian Moore; Dean Bourke. Source: Brian Moore (correspondence, Sept. 2010) • Point Blank video (courtesy of Brian Moore). Images: Point Blank video (Armidale Bowling Club). Personnel: Jeff Case (drums) ; Brad Dunham (vocals) ; Robert ‘Bob’ Jones (guitar/vocals) ; Michael Kregan (guitar) ; Brian ‘Lanky’ Moore (drums/vocals) ; Robert Santilli (bass) ; Eris Shanahan ; (vocals) ; Ron Thompson (rhythm guitar). 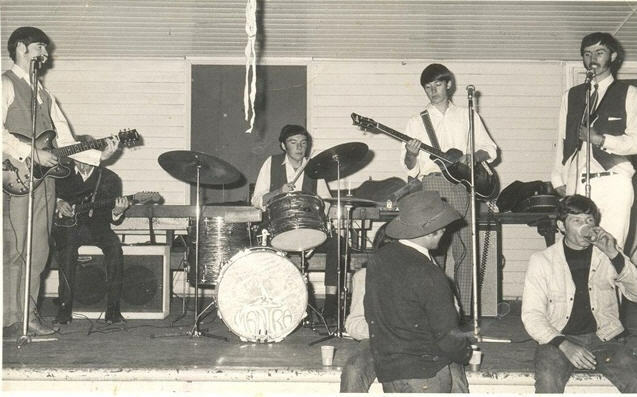 Purple Haze was one of two bands to form at De La Dalle College (now O’Connor High) in 1970, with both bands taking their names from Jimi Hendrix songs (the other band being Manic Depression). Original drummer Jeff Case was replaced by Brian Moore soon after the band formed due to pressure from his father, who didn’t like his son hanging around with ‘long-haired galoots.’ Moore, who had recently acquired a brand new set of drums was invited to joins and also subsequently helped provide additional vocals. 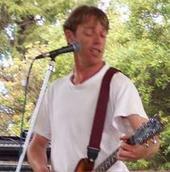 Original singer Eris Shanahan was also later replaced as frontman by Brad Dunham, while Michael Kregan’s position in the band was taken over by Bob Jones. Newly arrived from the United Kingdom, Jones’ English ‘cred’ charm and impressive record collection convinced the band to invite him in at Kregan’s expense. Purple Haze was essentially an all covers band, playing songs from 1960s and early 1970s artists such as Jimi Hendrix (“Purple Haze” and “Hey Joe“), Creedence Clearwater Revival (“Proud Mary“), The Doors (“Light My Fire“) and Them (“Gloria“). Purple Haze and Manic Depression joined forces in 1971 to become Shane. Source: Brian ‘Lanky’ Moore (interview, Aug. 2010). Music: Courtesy of Brian Moore. 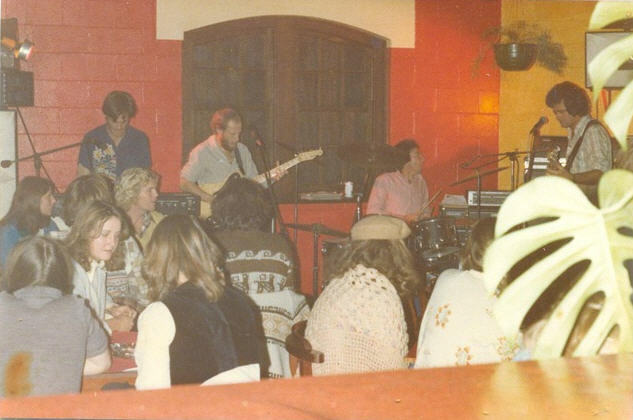 In 1981 the Armidale Ex-Services Club decided to try some music downstairs on Friday nights. 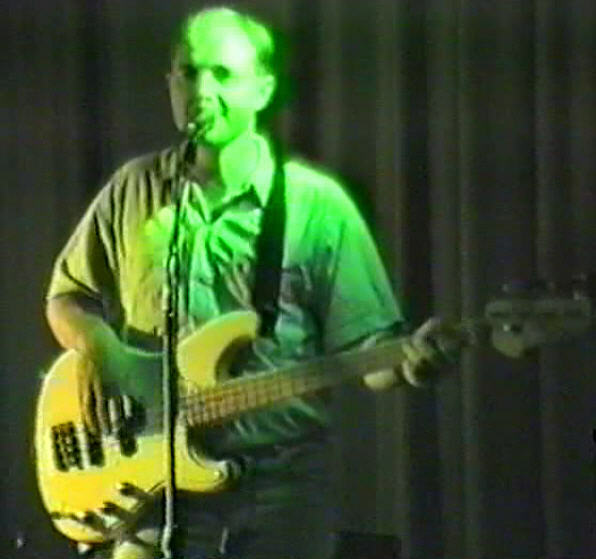 Ray Wilson, whose band Aquarius had been the club’s major local draw card since 1976, was consulted by the club’s management and he proposed the idea of a duo providing the music. He and fellow Aquarius guitarist/singer Peter Stanley subsequently formed Ray and Pete. With a popular following already established through their previous band Wilson and Stanley were instantly accepted. The duo played wide variety of music which could be enjoyed as people ate, drank or played the pokies, but could also be danced to (which people often did). Ray and Pete’s popularity effectively created a tradition at the Ex-Services Club for ‘unplugged-style’ shows which has continued for almost three decades. Source: Ray Wilson. ‘Aquarius band bio’ (thanks to Brian and Tricia Moore). Promoting itself from the early days as being from ‘Sydney,’ the Robbie Gray Big Band essentially operated as an in-house service – providing a floating line-up that played according to the needs of the venue. While its name suggests a larger ensemble this was only partly evident when the musicians acted as a backing group for touring performers. One of the band’s most regular bookings was a dinner music gig at the Galloping Grape wine bar and bistro. In similar fashion to the Moore Park Inn around that time, the ensemble often invited guest musicians to perform and jam with them during the course of the evening. Lasting little more than 18 months together the band eventually imploded through a combination of issues, primarily money, egos and addiction. Following the band’s break-up Gray briefly formed the Robbie Gray Band before returning to Sydney. John Grigg subsequently formed the John Grigg Jazz Group followed by the John Grigg Quartet (with Clive Gregory, Graham Wilson and Rhonda Burchmore). Sources: Brian Moore (interview, Aug. 2010) • Neil Osborne (corresondence, Nov. 2010). 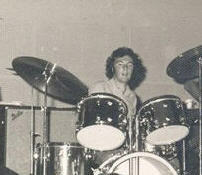 Playing a school dance at St Mary’s Cathedral Hall, Armidale in early 1975. L-R: Nobby Osborne, Doug Jamieson, Garry Osborne, Kim Constable, Robbie Gray. The Robbie Gray Band (RGB) originally comprised former Sydney musician John Grigg, Uralla singer Doug Jamieson (formerly of Trek), Moree bass player Kim ‘Kimbo’ Constable (who came to the town especially to join the band), and the Osborne brothers, Garry and Neil (drums and lead guitar respectively). The ensemble formed in the wake of Gray’s earlier unit, the Robbie Gray Big Band. Garry Osborne persuaded Gray to travel to the Gold Coast to see his brother, Neil (Nobby), playing with the band Shearwater. This subsequently led to Nobby returning to Armidale shortly afterward. 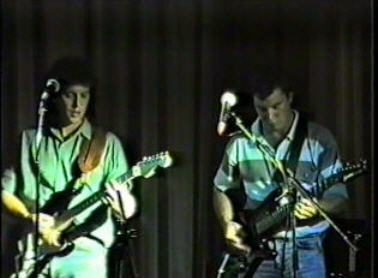 The trio then travelled to Moree to check out (and subsequently invite) Kim Constable to join the band. Doug Jamieson accepted his invitation to join as singer but tension between him and Constable (largely over Jamieson’s singing style) eventually saw him leave the band. 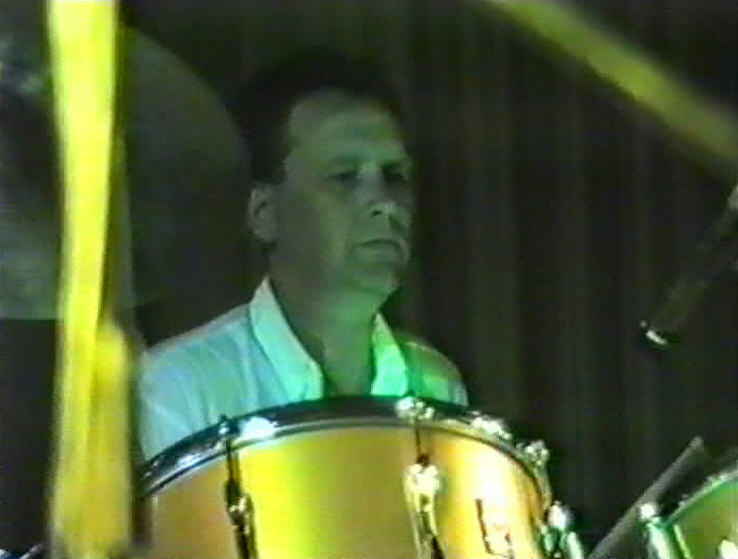 Following Jamieson’s departure, Constable suggested Paul Mailfert (originally a drummer from Moree) as his replacement. The invitation was fortuitous for Mailfert (a cook) as he had been thinking of opening his own business in Armidale. That business, Tall Paul’s, later became an institution in the town for many years. Among RGB’s cover material were songs from such artists as Steely Dan, Seals and Croft, the Average White Band, Stevie Wonder, Van Morrison, Santana, Jeff St John, Little River Band, The Doobie Brothers, The Eagles, Spectrum and The Band. Neil Osborne recalls that the band’s members were all so involved in other things, as well as fitting it gigs – as many as three to four a week – that rehearsing was often impossible. If they rehearsed at all it was usually at the Seven Brothers, but the general practice was for each member to learn a new song at home. The band would then run through it at the sound check and if all went well it was played that night. In 1976, a little over a year after starting the group Robbie Gray announced his intention to quit and return to Sydney. As RGB had already committed itself to a string of gigs keyboardist/singer James Arthur was asked to join temporarily on acoustic guitar/vocals in preparation for Gray’s departure. With its namesake gone the band obviously required a change of identity, and after much thought the band settled on a new name – Ukiah – taken from a song by The Doobie Brothers. All songs performed by Nobby Osborne (guitar), Garry Osborne (drums), Kim Constable (bass/vocals), Robbie Gray (keyboards/vocals), Paul Mailfert (backing vocals/congas). Source: Brian Moore (interview, Aug. 2010) • Neil Osborne (correspondence, Nov. 2010). Images: Photos courtesy of Neil Osborne. Music: Courtesy of Neil Osborne. Personnel incl. Ian Mitchell (drums) ; Peter Mitchell (lead vocals, acoustic guitar) Colin Sharp (bass) ; Ian Woolsey(electric guitar). The Rudiments formed in Sydney in 1992 initially as Legends of Obscurity. The original members comprised Peter and Ian Mitchell, their sister Judy, Tim Hewitt, Ian Woolsey and Colin Sharp. The band morphed into The Rudiments in 1994 (without Judy Mitchell or Tim Hewitt) and recorded five songs at Damian Gerard’s Studios (Ultimo). Released on cassette under the title I Want You To Be With Me, several hundred of these were eventually distributed. Three of the songs are by Peter Mitchell with the remaining two written by Ian Woolsey. Source: Peter Mitchell, The Great Unknown (1995), v. pags. Also associated with Crash Landing. Born and raised in Armidale, multi-instrumentalist/producer Richard Rummery’s father was involved in theatre in the city through the Armidale College of Advanced Education. As a child Rummery showed remarkable talent as a musician, being able to play back pieces of music after one listen. His career is largely associated with Armidale and Sydney, although he has toured much of Australia with various bands. Accomplished on piano, guitar, bass and drums at an early age he started out playing semi-punk/hard rock groups like Blue Max, Vice Squad, Health Club and Edge during his early years at high school. Rummery’s musical influences during his early years were British art rock bands like Genesis, Yes (particularly Alan Wakeman) and King Crimson, and he later expanded his musical horizons into this genre. After moving to Sydney in the late 1970s he completed a course in audio engineering at ASRE and established two progressive rock bands White Noise and Here and Now (with drummer Matt Hirst). In the mid-80s Rummery was invited to join Shooting School. Led by former Strapps lead singer/guitarist (UK) Ross Stagg, the band also included former Armidale guitarist Chris Green. The band were given an international publishing deal with EMI subsidiary Castle Music and signed with Polygram/Truetone (on the Vertigo label). Shooting School released the single ‘You Won’t Listen.’ and made an accompanying video. The single was produced by American producer Alan Mansfield (also a member of Dragon). Although the band toured extensively to promote the single (including a three month national tour as support to Dragon), a local industry ban on Polygram records killed its high rotation impetus. The band soon afterwards imploded due to the commercial pressure and musical differences. Around this same period he had also been collaborating with Chris Green in writing and recording songs under the name Da Kaboodle. A three song demo was produced but never released. During the late 1990s and early 2000s Rummery resided in Grafton, later moving back to Armidale where he has established himself once again as a leading musical figure in the New England music industry. In 2002 he formed a production company called November Media with Wayne Capper and set up a recording studio. Rummery’s latest musical project, ftprints11, was formed soon afterwards. Rummery and ftprints11 have so far released three CDs – Colourblind (2003), Thump and Unsound (both 2005). The latter CD has been described as pulling sonic references from everywhere, from ’70s prog rock and Nu-wave making it ideal for music appreciators with experience.’ A song from that CD, the single “Escape” was released in the USA in 2007 (through 3000 Records) and subsequently featured on the reality show Laguna Beach. Although essentially the platform for Rummery as a solo artist, ftprints11 has at various times comprised ancillary members such as Mark MacDonald (guitars), Graeme Burton (bass/drums/backing vocals), Anna Handibo (guitar/dulcimer/keyboards/percussion), Dylan Dempster (bass/backing vocals) and Kymbo (gamelan/djambe/djembuka/flute/ saxophone). Others to perform with the collective include David Morris, Jon Anderson and Paul Mailfert. Recording out of his own studio, Novamuse Studios, and releasing via the independent label, November Media Records, Rummery is afforded the flexibility to write and produce without allegiance to any specific genres. He has subsequently coined the term ‘flexrock’ to describe the eclectic brand of music he creates. Since 2007 Rummery has recorded two albums – Violet Millions (2007) and Cinderella’s Guts (2008). Rummery’s career has included being a radio producer, and this area he has won awards for Excellence in Broadcasting. One of his productions was a series of shows for CAHMA called “News from the War on Drugs” (aired on 2XXFM in the ACT). He has also recently completed a Ph D at the University of New England and is currently awaiting confirmation of its acceptance. To hear a selection of Richard Rummery’s songs go to: www.myspace.com/ftprints11 ; www.myspace.com/footprintseleven ; payplay.fm ; and showcase your music. Sources: Clay Djubal (2009) • Richard Rummery (correspondence, 2009). Images: Top photo courtesy of Clay Djubal • All other photos courtesy of Richard Rummery. † Copyright for this image has either not been ascertained ‘or we have been unable to locate the owner. If you are the copyright owner and want the image removed please contact this website. To see HGWT and the NTMIA’s copyright statement go to the “About the Northern Tablelands Music Industry Archive” page.